Put one hand on your belly and one on your upper chest. Take a deep, (NOT TOO DEEP) easy breath in through the nose. Determine which hand moves. 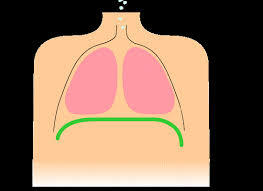 If your belly hand moved you’re a diaphragmatic breather, if your chest hand moved you’re a thoracic breather. Slowly inhale through your nose and push your belly out, imagine there’s a ballon in your belly and your filling it up. Your inhalation should be slightly deeper than your regular breath. The belly should come up an inch or so. Pause slightly and than exhale slowly out your mouth pushing all the air out completely, allowing the belly to go down. Than repeat the whole process. Do this 5-10 times per day for 1-2 minutes each time. There may be a chance of feeling dizzy or light headed when learning this exercise. If this happends, stop for a few moments before resuming in a less intense manner.